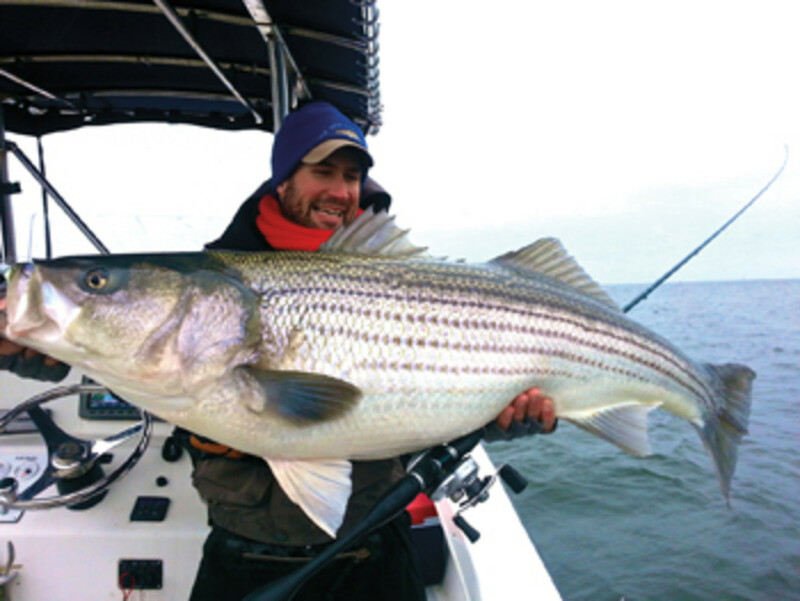 No matter what you call them — rockfish, stripers, linesiders or any of a host of other names — the striped bass (Morone saxatilis) is perhaps the most popular gamefish targeted by recreational anglers on the Atlantic coast. Moving up and down the Eastern Seaboard with the seasons, most of the largest of these fish spend their summers in New England before moving south in early winter to the waters off North Carolina. Then, from late winter into spring, a migration of epic proportions begins. This is when vast numbers of these fish — 70 to 90 percent of the entire stock — move their way into Chesapeake Bay to spawn, bound for the upper reaches of the Bay’s numerous tributaries. 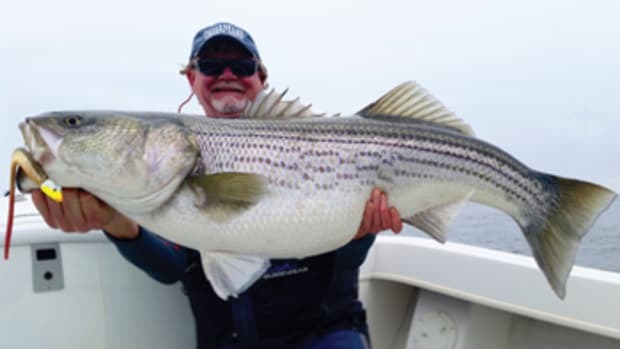 This massive caravan of large, breeding-stock fish creates an incredible opportunity, offering anglers the chance to tangle with world-class stripers, many 40 to 50 inches in length and weighing as much as 45 to 50 pounds — or more. As you may have guessed, the event draws thousands of anglers from up and down the coast. The striped bass’s tremendous popularity as a gamefish and a commercially harvested species means natural resources agencies in Maryland and Virginia strictly control the fishery. The regulations and geographic limitations of the fisheries are so complex during the spring trophy seasons that an entire article could be dedicated to spelling out the tangled jumble of dos and don’ts. Don’t let that deter you — a little online and tackle shop homework will keep you out of the hoosegow. 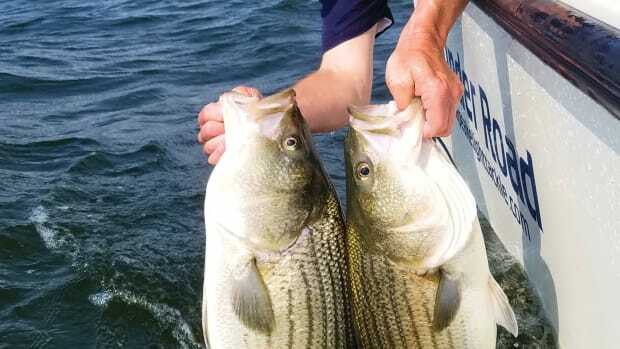 A complete list of regulations, dates and closure-area maps can be found for Maryland waters online at eregulations.com/maryland/fishing/striped-bass. Virginia’s striped bass rules are available by visiting the Virginia Marine Resources Commission website at mrc.virginia.gov and searching “striped bass.” Both agencies have apps available for Android and iOS mobile devices, and licenses can be acquired online. When in doubt, inquire about the rules from a reputable tackle shop that issues fishing licenses; it can help keep you on the right track. Despite the various date ranges and geographic regulations, the day many anglers in Maryland lose sleep waiting for each year is the third Saturday of April. Generically known as “Opening Day” among serious striper anglers, it’s an occasion when hundreds of boats and thousands of anglers flood the Bay, all on the hunt for the trophy of a lifetime. Sometimes the boats are so thick it feels as if you could walk across the Bay on them. If this isn’t your idea of a relaxing Saturday picnic, don’t worry; the trophy season in Maryland runs until May 15. I recommend picking a weekday if solitude is more your style. 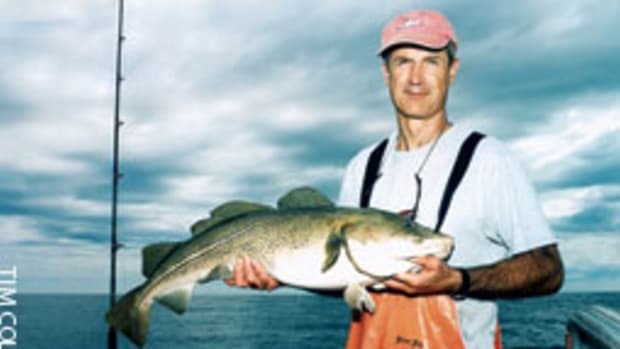 Each licensed angler is allowed to harvest one fish per day, with a minimum size of 35 inches, between April 16 and May 15 this year (in the designated areas). Since all Maryland tributaries are either closed to striped bass angling or designated as catch-and-release only, most spring trophy anglers in Maryland target the main stem of the Bay, a piscatorial superhighway that carries tens of thousands of migrating stripers to the headwaters to spawn. Hot spots include False Channel at the mouth of the Choptank River, the main shipping channel between Taylors Island and the Chesapeake Bay Bridges and the deeper channels just above the bridge spans. Most areas above the Brewerton Channel are either closed to fishing­ or limited to catch-and-release. An exciting striper opportunity in the Upper Chesapeake that’s been a bit of a roller-coaster ride over the last decade, in terms of reliability, is the Susquehanna Flats catch-and-release fishery. “The Flats,” as the area is generically known, is a shallow area of vast grass beds downstream of the Susquehanna and North East rivers and a prime staging area for spawning striped bass. Given the relatively shallow characteristics here, the flats fishery is almost entirely a fly and light-tackle game. The most exciting action on the flats can happen during dawn and dusk when weather conditions are calm. This is when a topwater fly or lure can draw repeated, explosive attacks from fish in the 30- to 45-inch range … or bigger. The sights and sounds of these strikes are akin to a Volkswagen bus being dropped from the sky into the water. Multiple hookups are the norm when the fish are keyed in on the surface, and a single angler can catch and release several big fish in a morning or afternoon here. In Virginia the spring trophy season is split between coastal areas and the state’s portion of Chesapeake Bay and its tributaries. 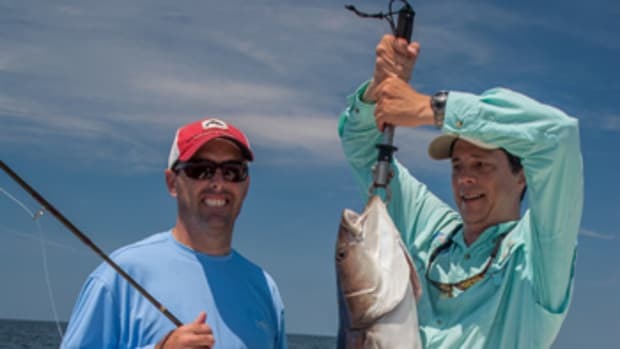 The coastal trophy fishery (east of a line approximately between Cape Henry and Fishermans Island at the mouth of the Bay) runs May 1 to 15, with a minimum size of 36 inches and a creel limit of one fish per person per day. 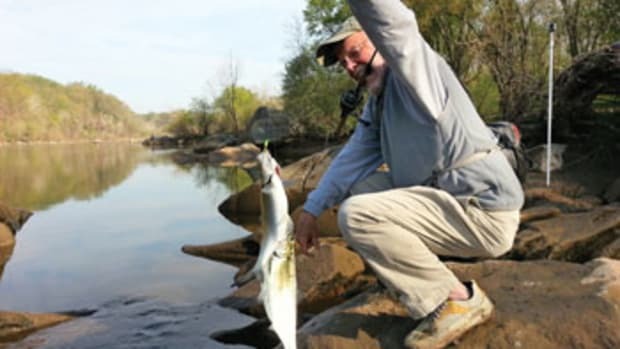 The Bay trophy season, which includes Virginia’s portion of the Bay and its tributaries, runs May 1 through June 15. Virginia also requires a special permit (free) for folks over 16 who are not fishing on a legally licensed headboat or charter boat. 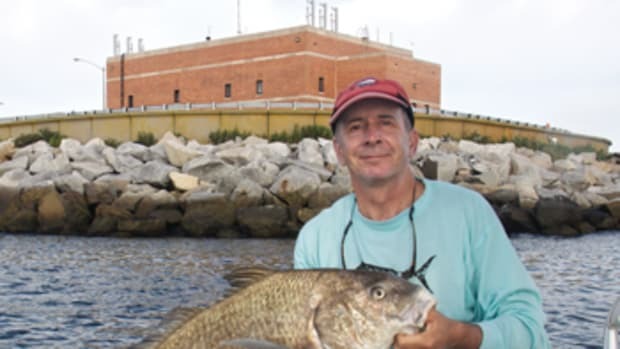 As in Maryland, Virginia anglers tend to target deeper shipping channels by trolling, though areas such as the Chesapeake Bay Bridge-Tunnel, the channel at Fishermans Inlet and the Kiptopeake Breakwater are popular with light-tackle anglers. Virginia fishermen also target large schools of migrating stripers both on the ocean side and at the mouth of the Bay by keying in on working birds, especially gannets. These large migratory birds are often a dead giveaway that feeding stripers are lurking below, and a large spread of lures trolled through the melee can be quite effective. 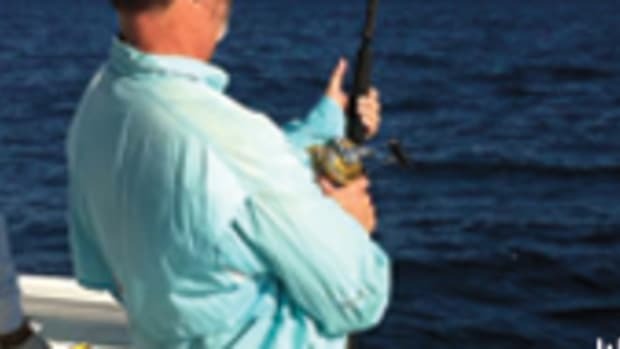 The vast majority of trophy fish caught during this season are taken by fishermen trolling large banquets of lures kept neatly and evenly spread behind the boat by planer boards. It’s not uncommon to see boats rigged up with a dozen or more rods. 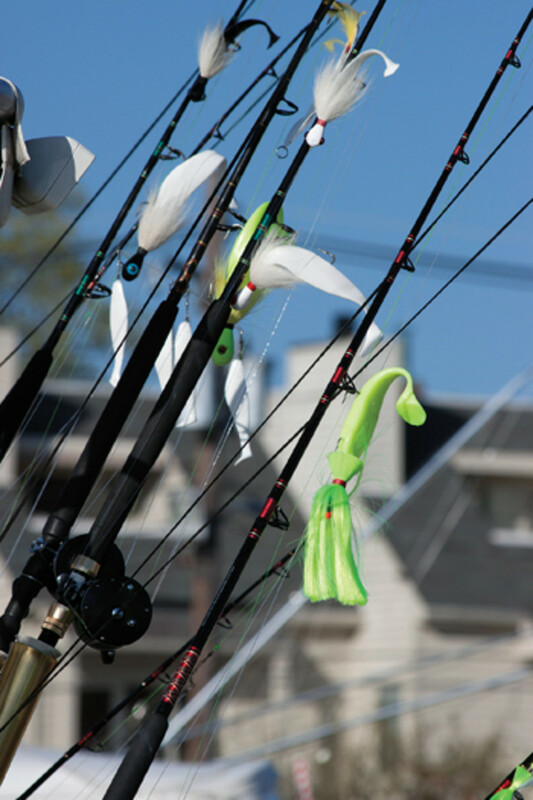 Typical setups include 5-1/2- to 6-foot, 20- to 50-pound rod-and-reel rigs towing umbrellas, bucktails, parachutes, tandem rigs and large spoons set at varying depths with inline lead weights. Anglers who work the entire water column often do best. 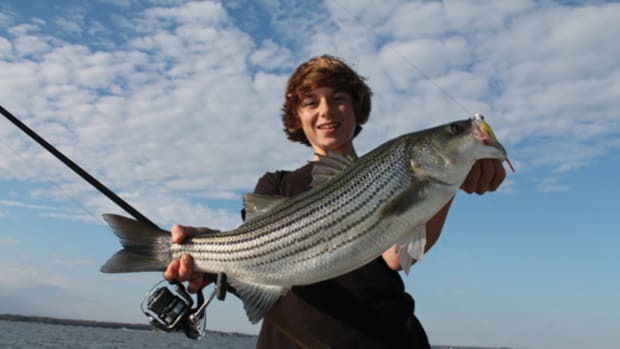 Newbie striper anglers are best served by investing time at local tackle shops before hitting the water. Most have pro staff who can help you pick rods, reels and lures, as well as help you get the whole system rigged up. Some even offer trolling packages with half a dozen or more rods that are prerigged and ready to go — planer boards and all. And before we wrap, a little talk about conservation. Although plenty of anglers keep their trophies for a fine meal at home — and there’s absolutely nothing wrong with that — more and more are simply snapping a photo and then releasing their catch, allowing it to move on and spawn. It’s an option worth considering if you participate in this fantastic fishery, helping sustain the population of large breeding fish for generations to come. This article originally appeared in the May 2016 issue. A dead calm settles across Chesapeake Bay, and a blazing September sun hangs low in the sky as we motor slowly around the grass-lined fringes of Goose Island. The location may be only a short cruise from Tangier Island, Virginia, but it feels as if we’re a million miles from nowhere.